I never used to be a fan of travel wallets as I thought they were just waste of money and fussed. Just a normal bifold wallet was enough, why I had to get it. But sooner, I gradually got my answer after a few times taking international flights, my passport began to be battered, get some wrinkles and its corners were nearly fallen apart. Another inconvenient thing is that with international flights, you aren’t allowed using mobile boarding pass, which means you have to carry a bunch of documents and notes. Importantly, they are not ordinary documents, they are essential enough to cancel your flight if you accidentally lost them. Not saying that, when I traveled with my partners, it was shameful to take out an old passport full of wrinkles in front of my friends. That’s why I started to look into some passport holder and travel wallets. At first, I thought they were just something out of fashion for passport covering and my essentials’ storage. But I was seriously wrong. There are tons of designs, colors, shapes with eye-catching outlook plus great functionality. And with all my sincere, I advise you to also get at least one to keep your passport and other important documents streamlined. 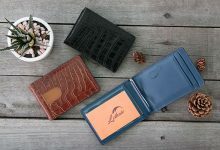 If you have no idea about which are good to drop your money on, have a look at my collection of the best travel wallets for men. What have you prepared for your travel trip? 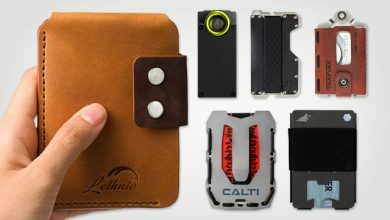 Clothes, shoes, essential stuff, camera… And how about a cool passport cover? If you focus on fashion significantly, don’t just look for a basic cover. Instead, why not change it into one of your unique accessories? 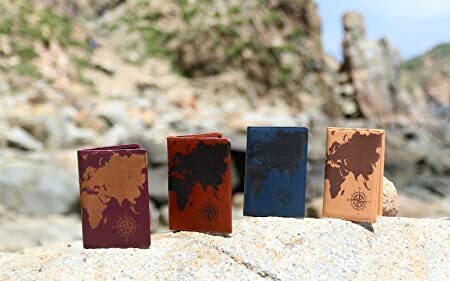 A masculine passport cover wallet will nail up your airport fashion taste, make you confident and on the other hand, give you more wonderful picture to memorize your trip. With this Lethnic’s, there’s an amazing compromise of design, protection and function. Take a look at it, the hand-painted world map image is superbly delicate and one of a kind. It’s created from eco-friendly paints with an extra crystal glue on the outside for better longevity. Plus, the premium genuine cowhide leather brings a nice feeling touch and its light shine matches perfectly with the image to deliver a distinctive luxe. Going inside, it’s super well-organized with 1 passport pouch, 5 card slots, 3 bill compartment and 1 SIM card slot. On the other hand, it’s covered by the RFID Blocking Technology to save you from hi-tech thieves, especially when traveling to European countries. Two colorways to choose from: silver and gold that are both easy to style with. On top of that, there’s a 1-year warranty provided if you buy the product. If you are a regular reader of BestWalletReview, chances do you realize how often I remind this brand on my collections. They are a new brand, though, they make my favorite wallets. I do appreciate how hard working they have been to provide such fantastic products with the perfect compromise of designs and functionality. 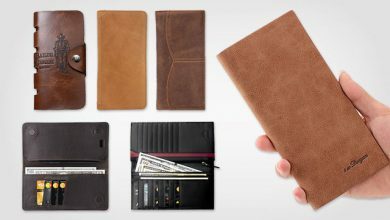 A typical example is this leather passport wallet. 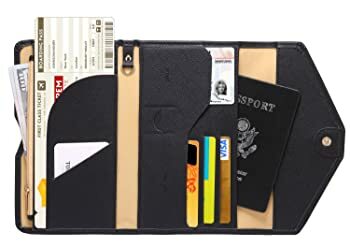 Actually, it’s not only an ordinary passport holder, but also a slim wallet that integrates many compartments with different sizes to opt for various stuff, such as boarding pass, tickets, local currency, dollars, cards, and even SIM card or memory card. Though I have to fold my bills to fit this wallet, a compliment is it having up to three compartments for currency so I can streamline and organize my local currency, dollars, and other documents very well. It also helps me find what I need more quickly, especially when I’m in a hurry. Not only come up with strong stitching and nice linings, the wallet also hooks my eyes for its outer performance. 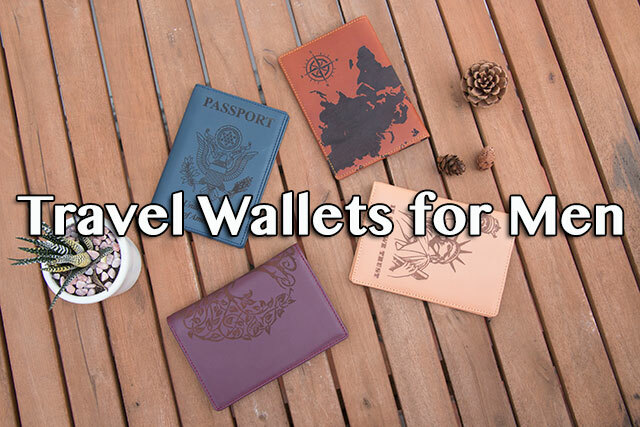 There are 4 designs, but let me talk to you about mine, which is the World Map passport holder. Based on the information from Lethnic, the World Map image on the outside was made by advanced laser cutting technology. That’s why the cutting line is very clean, even and beautiful. Besides, its material – cowhide genuine leather – is a plus point, very soft and comfortable touch. 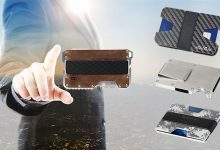 Particularly, there are RFID Blocking Technology added to this wallet, which I think it is a must-have feature for those travel wallets as it helps to protect your personal information against disclosure. In terms of luggage and travel gears, you can rely on Zoppen for a variety of colors. This fun, trifold passport holder comes up with a color scheme of 20+ tones that I can pretty sure you will find your favorite here. And, this wallet is made from PU leather, though. Actually, I used to underestimate this kind of manmade material, but lately, its high quality and benefits have changed my mind. Not all Pu leather items are bad, my friends. For example, this Zoppen travel wallet passport holder! Not only it’s high quality, but also Eco-Friendly. Importantly, its material passed US EN71, Euro REACH Quality Standard, and US CA Prop 65 Test, so you can feel ease in mind to give it a try. And trust me, you won’t regret! 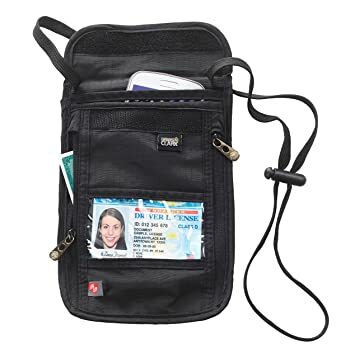 This wallet features 3 credit cards slots, 1 boarding pass compartment, 1 passport pocket, 1 id slot, 1 coupon ticket slot, 1 sim card pouch, 1 cellphone pouch (max 5.8 inches), 1 key holder and 1 pen holder, 1 money & coins zippered pocket (fit U.S. money), and 1 slim pocket. To that end, it can fit a passport alongside other documents, cards, currency and tickets. The interior is designed smartly and modernly, always have slashes for quick access. Not saying that all stitching and linings are well-made to deliver the greatest durability. If you hate your old wallet always opening inside your bag, this one will kill that issue thanks to its button snap. But the best thing here is its two full-length compartments with one open and one zippered, roomy enough to store either your smart phone or bills and documents. I also like the way it is closed, very clean and neat silhouette, look quite masculine, luxury and professional. In a brief talk, this is a perfect passport wallet for solo travelers who are seeking a squared, lightweight way to keep streamlined. This is a great functional organizer for those who like a low-profile with ultra-slim design to stay under their clothes plus protect their valuable belongings from potential thieves. As it is designed as a hidden item to traveler, its outer look is so-so. The manufacturer focused more on its functionality and this is also its biggest advantage. 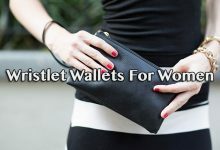 The whole wallet is made from the brand’s special TravelDry fabric with self-repairing zippers and strong rip-stop nylon. Might you already know about the rip-stop nylon and self-repairing zippers for its superb durability, convenience and water resistance. Hence, I will talk more about the special TravelDry fabric, which is a one of a kind material to enable to wick moisture away as well as resist mildew, odors and shrinking. I like this feature the most as it helps me feel comfortable all day, even when I wore it in hot days and sweated a lot. 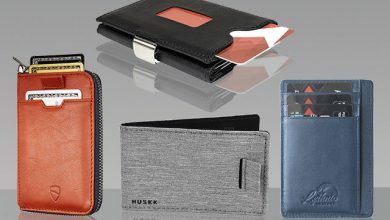 Although slim, this neck wallet comes up with spacious capacity to accommodate many coins, cards, bills, documents, electronics and stuff like that. Like Lethnic Passport Holder, this Lewis N. Clark is added RFID Blocking Material. Neck travel wallet is convenient. However, I know that some of us prefer to wear t-shirts and don’t like anything friction around our naked neck, especially when you are sweating. To that end, let’s opt for a belt travel purse instead. This seems like a better choice as you can wrap it around your hips, outside your shirt. The reason I choose this Alpha Keeper belt wallet is its tons of functionality and convenience. Firstly, the breathable mesh back panel to save us from body heat and sweat during a long day carrying, very thoughtful. Next is the water resistant 210D rip-stop nylon to protect your valuables against moisture, rains, and sweat, particularly for the electronics. Also, no worry about poor material that easily wears and tears. Or, no worry about your belongings falling out through those tears and holes. Even have a look at the stitching, you will see how well-made it is. The zippers are YKK, too. Very durable and longevity! In terms of construction, there are two main zip-around compartments fitting up passport, documents, tickets, boarding pass, coins, cards and currency. But here is where the real fun begins – the secret pocket on the backside in which you can store some more valuables like cash and cards. Another good thing is its belt strap. The front facing buckles are very sturdy, works smoothly as well as the strap itself is able to adjustable to fit your hip size ultimately. And don’t worry, it’s equipped with RFID Shield. First of all, I personally think the colorway of this Zero Grid is perfect. The neck wallet comes up with 4 colors: either ash, desert sand, midnight or shadow grey. The small, black tapes, the black pull tabs with printed brand name and printed logo in the front are subtle details on the otherwise low-profile interior. Dimensions: 7.5 x 0.1 x 5.1 inches. Two Deep vertical YKK zip-around compartments, one open mesh pouch in the middle for quick phone access and one horizontal YKK zippered pocket. It can also fit up to 4 passports and helps to simplify your air travel. Even when you store some electronics inside this wallet, just worry free about the weather as the material is no tear, no puncture and water resistant. Either the strap is comfortable and multifunctional. You can wear it around your neck or strap to any belt due to personal preference. 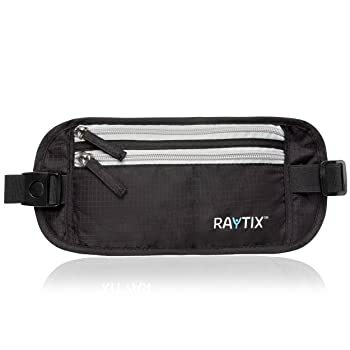 This wallet is thin, but surprisingly, it includes 6 layers: the outermost is durable rip-stop nylon, next is the lightweight water-resistant fabric layers, RFID Shield and lastly, the breathable moisture-wicking mesh backing. Impressive, right? On top of that, the manufacturer also offers trustful money-back warranty so that you can feel ease in mind to give it a try. 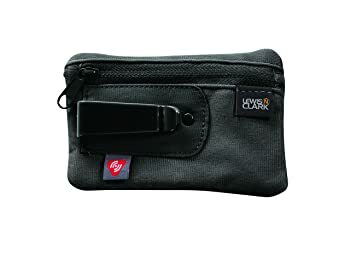 Like other mens travel wallets in this collection, this also protects your bank details and personal information with its RFID Blocking Technology in 13.56 MHz Frequency. The belt black wallet features two zip-around pockets in the front and one mesh on the backside. It is measured by 1 x 5.5 x 0.4 inches. 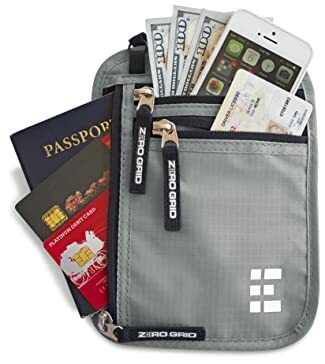 Though compact, it can fit up 2-3 passports alongside with other things like cards, cash, keys, pen, tickets and boarding pass, and the rip-stop durable nylon material also enhances how multiuse and practical it is. If you are wondering about its zippers, they are from YKK – the most famous brand in international standard quality zipper. Work smoothly, durable and longevity. Plus, the mesh is breathable enough to help you feel comfortable all-day long. 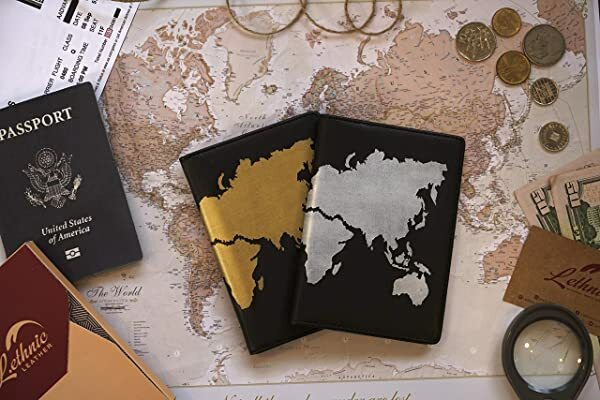 Might this passport not be as style-focused as the others in this collection, however, if you are a traveler taking responsibility for many passports, documents and tickets, go for this product. Parents and teachers, I am looking at you. Looking at its luxurious outer performance, might you think this card protector is very expensive, but no, it comes off very affordable price. In this modern life, we all know that identity thieves are more and more, which means the risks of losing personal information or bank details get higher and higher. Just imagine if you were unluckily a victim of ID stolen, there would be tons of inconvenience like waiting for hours of canceling your bank cards or always anxiety over identity thieves. Not saying that, if you travel abroad, there must be even worse. That’s why I always remind you to opt for those RFID travel purses. 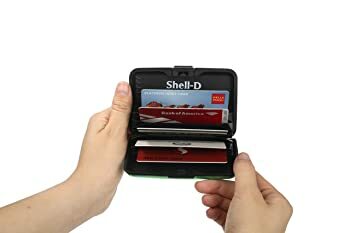 This security wallet from Shell-D is my high recommendation. Firstly, for its perfect RFID Blocking ability. This card protector can block any RFID signals in both 13.56 MHz and 125 KHz Frequency. To that end, whether it is your bank cards, ID cards or your hotel passing cards and badges, they will all safe against hi-tech thieves. Next is its sturdy construction. 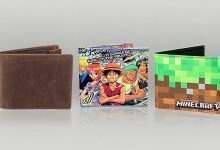 As made from high quality material, this wallet is not only strong and hard, but also very durable to keep your cards safety against breaking or bending. It features 7 card slots, but you can accommodate up to 9 cards or utilizes some of them as money storage. You will love their playful colorway, as well if you are a person who love to show up your characteristic personality or stand out from the crowd. I remember the first time I saw this “wallet”, it totally blew my mind. It’s fun and interesting! Like you are going to play hide and seek with thieves. Haha. But honestly, I appreciate its ability to secure our valuables thanks to its invisible pockets. This belt wallet, it’s really a multi-functional item. 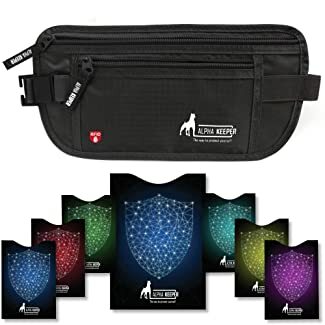 You can wear it as a genuine belt to hold your jeans or trousers as well as keep some small valuable stuff inside like cash and regular cards. 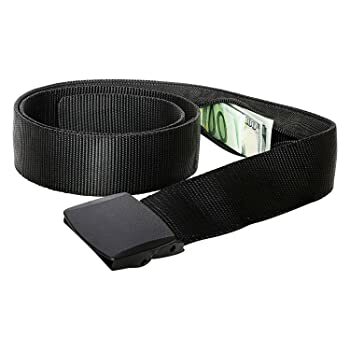 When in need, just put your hands to the pocket as the belt is made from high quality elastic material. That said, this belt can fit any hip sizes no matter you’re chubby or thin. In terms of the secret zippered pocket, it is long and roomy enough to fit up your ID card, bank cards and some cash. Talking about the hardware, they are all made from YKK for the highest durability and longevity. All in all, I really like this idea. It’s compact, protective and those thieves, they don’t even dream that your valuables are stored there. Yes, another belt wallet, but this one is from Zero Grid. Basically, this product is similar to the one above. Made of durable nylon webbing, YKK zipper and buckle, wide zippered secretly pocket for valuable stuff, minimalist design and great elastic material for better adjustment. But in comparison detailly, there are still some advanced in this Zero Grid. Firstly, its non-metal buckle can be removable totally. Next is its invisible pocket. Commonly, you will need to fold your bills and currency many times to fit such small pocket, right? 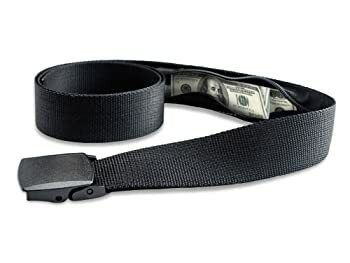 But this belt comes up with wider compartment so that you just need to fold it once. No more wasting time. Take your cash more easily and quickly. Very convenient! Besides, Zero Grid also provides reliable warranty so that you can feel ease in mind to try it. This is another innovative product that I am so interested to show you – Lewis Travel Belt Wallet. This is a special product as it doesn’t end up with a long elastic or adjustable strap to wrap around your hips. Instead, it has a hidden clip stash. Don’t worry, it is very durable and powerful so you can clip it in any belts without falling out or getting loose. 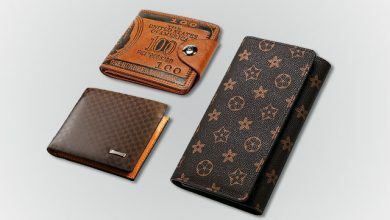 Moreover, the material of this wallet is very fantastic. It is the special TravelDry fabric that can wick away moisture and sweat easily to offer ultimate protection to your inner stuff. Besides, as I said before, it enables to prevent odor and mildew effectively. Even you have to carry it all day, in many days and sweating a lot, don’t fret, the wallet won’t have any inconvenient smell for sure. There’s more, lightweight fabric, self-repairing zipper and strong rip-stop nylon. If you are curious about its dimensions, 3.5 x 4.5 inches, very compact and concise. But don’t quickly judge a book by its cover, this wallet can fit up many essential things like cards, cash, coins, ID card, keys and stuff like that. I think if you are a solo traveler, just go for it. 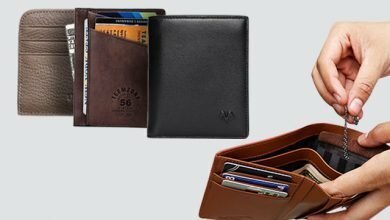 These ten best travel wallets for men in my collection are all from trustful brands that I have already tested for a while so, you can feel ease in mind to give it a try. I believe that with such various designs, types and functions, you will find out at least one for your next wardrobe item. Goodluck!